Plaque in tribute to Claude Bernard, at Collège de France in Paris, France. 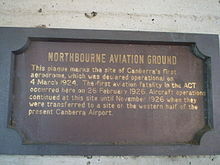 This sign in Dickson, Australian Capital Territory commemorates the establishment of Canberra's first aerodrome and its first fatality in the 1920s. The Benin Empire, which flourished in present-day Nigeria between the thirteenth and nineteenth centuries, had an exceedingly rich sculptural tradition. One of the kingdom's chief sites of cultural production was the elaborate ceremonial court of the Oba (divine king) at the palace in Benin. Among the wide range of artistic forms produced at the court were rectangular brass or bronze plaques. At least a portion of these plaques, which were mainly created from the thirteenth through sixteenth centuries, commemorate significant persons and events associated with the Oba's court, including important battles during Benin's sixteenth century expansionary period. Brass or bronze memorial plaques were produced throughout medieval Europe from at least the early thirteenth through the sixteenth centuries as a form of sepulchral memorial generally inset into the walls of churches or surfaces of tombs. Surviving in great numbers, they were manufactured from sheet brass or latten, very occasionally coloured with enamels, and tend to depict highly conventional figures with brief inscriptions. Sir Henry Cole helped set up the first historical marker scheme in 1866. Historical markers are put on display by the owners of sites listed by national agencies concerned with historic preservation such as the National Trust for Historic Preservation and the National Register of Historic Places (in the United States), the National Trust for Places of Historic Interest or Natural Beauty (in the United Kingdom), An Taisce (in Ireland), National Historical Commission of the Philippines (in the Philippines), and the National Trusts of other countries. Other historical markers are created by local municipalities, non-profit organizations, companies, or individuals. In addition to geographically defined regions, individual organizations, such as E Clampus Vitus or the American Society of Mechanical Engineers, can choose to maintain a national set of historical markers that fit a certain theme. The Royal Society of Arts established the first scheme in the world for historical commemoration on plaques in 1866. 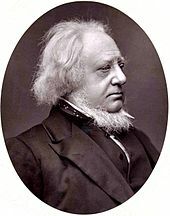 The scheme was established under the influence of the British politician William Ewart and the civil servant Henry Cole. The first plaque was unveiled in 1867 to commemorate Lord Byron at his birthplace, 24 Holles Street, Cavendish Square. The earliest historical marker to survive, commemorates Napoleon III in King Street, St James's, and was also put up in 1867. The original plaque colour was blue, but this was changed by the manufacturer Minton, Hollins & Co to chocolate brown to save money. In 1901, the scheme was first taken over by the local government authority - the London County Council. Historical markers (Filipino: panandang pangkasaysayan) are cast-iron plaques installed all over the Philippines that commemorate people, places, personalities, structures, and events. They are installed by the National Historical Commission of the Philippines. This practice started in 1933, with NHCP's predecessor, the Philippine Historical Research and Markers Committee, which initially only marked antiquities in Manila. The initial markers were placed in 1934. Markers have their texts primarily in Filipino, while there are also markers in the English language, especially for markers that were installed during the American occupation. Markers in regional languages such as Cebuano, Ilocano, and Kapampangan, are also available and issued by the NHCP. Markers are found all over the country, and there have been markers installed outside the country. The plaques themselves are permanent signs installed in publicly visible locations on buildings, monuments, or in special locations. There are more than 1,500 markers to date. Most markers are located within Luzon, especially in Metro Manila, which has prompted the NHCP to install more markers in Visayas and Mindanao, for their greater inclusion in the national historical narrative. Issues and controversies have also been the concern of several individual markers, from the commemoration of the late dictator Ferdinand Marcos to the reaction of the Japanese embassy to the comfort women statue and marker. There have also been some markers replaced by new ones because of rectified information, theft, or loss due to war or disasters. Many American-era markers have been destroyed or were lost as casualties of World War II. Local municipalities and cities can also install markers of figures and events of local significance. Though they may have the permission of the NHCP, these markers are barred from using the seal of the Republic of the Philippines. This Greater London Council blue plaque at Alexandra Palace commemorates the launch of BBC Television there in 1936. Blue plaques are the principal type of historical markers found throughout England and are the closest thing there is to a historical marker system in that country. An example is the blue plaque scheme run by English Heritage in London, although these were originally erected in a variety of shapes and colors. The National Trust (which is a non-profit charity organization unlike English Heritage and English Heritage properties) has its own similar markers as well. However, not all historical markers in the United Kingdom are blue, and many are not ceramic. There are commemorative plaque schemes in Bath, Edinburgh, Brighton, Liverpool, Loughton, and elsewhere—some of which differ from the familiar blue plaque. A scheme in Manchester uses color-coded plaques to commemorate figures, with each of the colors corresponding to the person's occupation. The Dead Comics' Society installs blue plaques to commemorate the former residences of well-known comedians, including those of Sid James and John Le Mesurier. In 2003, the London Borough of Southwark started a plaque scheme which included living people in the awards. Even in London, the Westminster City Council runs a green plaque scheme which is run alongside that of the blue plaque scheme administered by English Heritage. Other schemes are run by civic societies, district or town councils, or local history groups, and often operate with different criteria. In 2010, British tabloid The Sun placed a red coloured plaque outside the Snappy Snaps store in Hampstead, North London where singer George Michael crashed in the early hours of Sunday 4 July 2010. The newspaper stated it planned to put similar plaques in sites around the UK to mark events that had proved popular in the UK Tabloid Press. In England, the London blue plaques scheme, which is administered by English Heritage, has been running for over 140 years and is thought to be the oldest of its kind in the world. Plaques are attached to buildings to commemorate their association with important occupants or events. A range of other commemorative plaque schemes, which are typically run by local councils and charitable bodies, exists throughout the United Kingdom. These tend to use their own criteria for determining the eligibility to put up a plaque. A list of schemes currently operating in England is available on the English Heritage website. After the First World War, the families of British and British Empire (now Commonwealth) service men and women killed during the conflict were presented with bronze Memorial Plaques. The plaques, of about 125 millimetres (4.9 in) in diameter, were designed by the eminent sculptor and medallist, Edward Carter Preston. In the United States, various state governments have commemorative plaque schemes usually using the name historical markers. The National Trust for Historic Preservation or the U.S. Government, through the National Register of Historic Places, can bestow historical status. State programmes, such as the California Register of Historical Resources, allow designated sites to place their own markers. The criteria and circumstances through which a party administers the distribution of historical markers varies. For example, the "Preservation Worcester" program in Worcester, Massachusetts, allows a person to register their house or other structure of least fifty years of age if the building is well preserved, with retention of its original character and importance to the architectural, cultural or historical nature of the local neighborhood. One then pays a fee ($185 to $225) to receive the historical marker itself. These historical markers indicate the location of Francis Parkman House, a National Historic Landmark on Beacon Hill in Boston, Massachusetts. In the same state, the Boston neighborhood of Charlestown, Massachusetts has its own local association to administer historical markers. Other historical markers in and around Boston are administered by agencies such as The Bostonian Society or are associated with sites such as those along the Freedom Trail, the Black Heritage Trail, and the Emerald Necklace. Other examples of mostly locally generated historical markers in the United States include the plaque outside the Alaska Governor's Mansion made by the Alaska Centennial Commission's historical markers program, the historical markers of State Historic Marker Council in Florida, the markers placed by various agencies in Georgia (of which one source mentions 3,292 different historical markers), in Indiana, where it is illegal to create a historical marker in the "state format" without first getting official approval from that state's historical bureau, historical markers in Kansas erected by the Kansas Historical Society and the Kansas Department of Transportation, the Roadside Historic Marker Program in Maryland administered by the Maryland Historical Trust, the State Historic Marker Program of New York (begun in 1926 to commemorate the Sequicentennial of the American Revolution), the historic markers placed as recently as 2008 in Sussex County, New Jersey, the New Mexico historical markers printed in white letters on a brown background by the New Mexico Department of Transportation, the historical markers of North Carolina (the Historical Publications Section of the state Office of Archives and History publishes a Guide to North Carolina Highway Historical Markers), the more than 1200 historical markers of Ohio (all of which are now made in a Marietta, Ohio workshop), and over 550 official state markers in Wisconsin. As the price of scrap metal has increased plaques have been the target of metal thieves wishing to resell the metal for cash. Plaques or, more often, plaquettes, are also given as awards instead of trophies or ribbons. Such plaques usually bear text describing the reason for the award and, often, the date of the award. Plaque of Edward VII by Emil Fuchs at The King's Hall Herne Bay, Kent, England (1913). National Trust for Places of Historic Interest or Natural Beauty — England, Wales, and Northern Ireland. ^ a b "Historic Markers Across Georgia". Latitude 34 North. Retrieved 31 October 2008. ^ Ezra, Kate (1992). Royal Art of Benin: The Perls Collection in the Metropolitan Museum of Art. New York: Metropolitan Museum of Art. ISBN 0810964147. ^ "Benin plaque: the oba with Europeans". The British Museum. Retrieved 27 June 2015. ^ Plankensteiner, Barbara (22 December 2007). "Benin—Kings and Rituals: Court Arts from Nigeria". African Arts. University of California. ISSN 0001-9933. Retrieved 27 June 2015. Chisholm, Hugh, ed. (1911). "Brasses, Monumental" . Encyclopædia Britannica. 4 (11th ed.). Cambridge University Press. ^ Badham, Sally; Norris, Malcolm (1999). Early Incised Slabs and Brasses. London: Society of Antiquaries. ^ "National Register of Historic Places". National Park Service. Archived from the original on 9 July 2008. Retrieved 31 October 2008. ^ "The National Trust". Retrieved 31 October 2008. ^ "An Taisce". National Trust for Ireland. Retrieved 31 October 2008. ^ "Making their markers". The News & Observer. Archived from the original on 10 February 2009. Retrieved 31 October 2008. ^ "Blue Plaques". English Heritage. Retrieved 16 June 2011. ^ "History of the Blue Plaques Scheme". English Heritage. Retrieved 16 June 2011. ^ "About blue plaques". Royal Borough of Kensington and Chelsea. Retrieved 16 June 2011. ^ "The Blue Plaque Design". English Heritage. Retrieved 16 June 2011. ^ Historical Markers Placed by the Philippine Historical Committee. Manila: Bureau of Printing. 1958. ^ "2011-2012.pdf". Google Docs. Retrieved 2 February 2018. ^ "GUIDELINES_IDENTIF CLASSIF AND RECOG OF HIST SITES & STRUCTS IN THE PHIL.pdf". Google Docs. Retrieved 2 February 2018. ^ a b Markeroni.com Archived 15 January 2016 at the Wayback Machine, Information about historical markers and historical plaques, and historic preservation in England, British Isles. ^ a b "English Heritage". English Heritage. 26 October 2011. Retrieved 30 November 2011. ^ "The Sun marks the dented shop front where stoned George Michael crashed" Archived 3 March 2016 at the Wayback Machine, The Sun, accessed 2010-09-18. ^ "History of the Blue Plaques Scheme". Retrieved 30 July 2012. ^ "Preservationworcester.org". Preservationworcester.org. Archived from the original on 6 November 2011. Retrieved 30 November 2011. ^ "Charlestownpreservation.org". Charlestownpreservation.org. Archived from the original on 5 October 2011. Retrieved 30 November 2011. ^ "Boston National Historic Park". Nps.gov. 17 November 2011. Retrieved 30 November 2011. ^ "Alaska Historic Markers". Waymarking.com. 31 January 2011. Retrieved 30 November 2011. ^ "Historical Marker FAQs". In.gov. 16 June 2009. Archived from the original on 15 February 2009. Retrieved 30 November 2011. ^ "Kansas Historical Markers". Kshs.org. Retrieved 30 November 2011. ^ "New York State Museum". Nysm.nysed.gov. 1 December 1998. Archived from the original on 5 September 2015. Retrieved 30 November 2011. ^ "Sussex County News and Information". Sussex.nj.us. 14 May 2008. Retrieved 30 November 2011. ^ "Manufacturing Ohio's Historic Markers". Touring-ohio.com. Archived from the original on 2 October 2011. Retrieved 30 November 2011. ^ "Wisconsin Historical Society". Wisconsinhistory.org. Retrieved 30 November 2011. ^ Hightower, Eve (13 December 2007). "Stanislaus supervisor wants recycling ordinance used to fight metal theft regionally". The Modesto Bee. Archived from the original on 23 February 2008. Retrieved 17 November 2010. James Loewen, Lies Across America: What Our Historic Sites Get Wrong, 1999.